Avid RPG fans will definitely be able to identify with the many different kinds of dice out there, where certain dice are used for select throws. 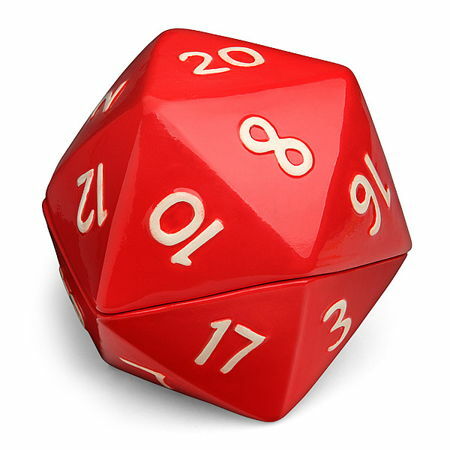 The almighty D20 is one of the more popular dice out there in the market, and Thinkgeek has come up with something which will literally help you in the mantra of “eat, sleep, live D&D” – through the form of the $12.99 D20 Bowl Set, that is. With the D20 Bowl Set, you can be sure that your mind is never too far away from the current D&D campaign even as you chow down on a particular dish. When not in use, the two bowls will interlock in order to form a full D20, making it ideal for display as well. Made out of ceramic, it is both microwave and dishwasher safe.